We're all familiar with traditional reward programs that bestow points for being loyal to a particular shop or airline. That trend, which has been around for a while now, is getting a boost from mobile technology to bring buyers and sellers together. More and more, retailers are moving away from loyalty cards and towards loyalty phone apps. The Shopkick app for both iPhone and Android is on the leading edge of this movement. Walk into a partner store, open the app and automatically receive points without having to fill out an application or even having to purchase anything. Walk into enough stores and you'll rack up enough points to redeem them for something you want. 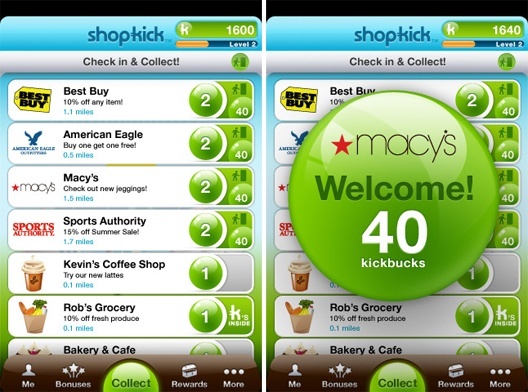 Shopkick harnesses the power of smartphones and unites the physical and digital realms. It is already one of the top shopping apps in the United States. Will this model take over the shopping world?